While there was 'an app for that' there were no printed maps for us non-smart phone people (or even worse – us Blackberry people!) The individuals working the 'exclusive' Social Media Tent had absolutely no information regarding locations and after several questions (and helpers) I was sent off with a 'good luck with that'. The worst part is that I remain worried that I missed an entire aspect of the event because I did not have a printed map! The confusion continued as I discovered that the coupons handed to me at the Social Media Tent were not, in fact, the drink tokens required for beer. I stood in line to purchase the correct drink tokens only to discover that drink tokens were only sold in quantities of twenty – encouraging and ensuring maximum drunkenness! 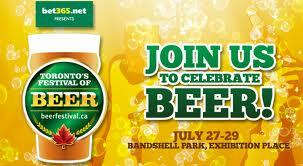 (God forbid that we actually savor the beer at a beer festival!) After the right amount of cash was procured I stood in line again to purchase the drink tokens, after leaving the window I realized that I still had no idea how many drink tokens were required for a drink! The ratio of beer to token was one of the only satisfactory aspects of the event (although I think this was mostly a consequence of a small tasting glass!) Oh and the beer was okay too! The twenty drink tokens allowed me to sample any and all beers of interest to me and even left a few extras to return to the favorites. Overall this event was more satisfactory than Cask Days – but only because last year's Cask Day ran out of beer by Sunday! The Small Print: I received free entry into this event. I did not promise a positive review. The opinions presented are my own.